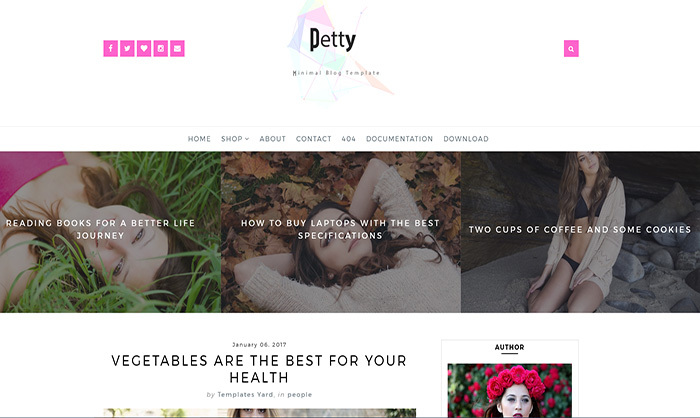 Petty Blogger Template is ideal choice for those who love nature and travel. If you own any type of Personal, Nature or Hobby type blog then this is one of the ideal theme for your blog, Why? Because it comes with many unique features that we are going to explain here. The first and one of the amazing feature of this template is that. It comes with fast, responsive and SEO friendlydesign. So if you know something about SEO then you may know the importance of these features because you can easily improve SEO score of your site with these features. The another awesome feature of this template is that it has unique slider in head section that you can use to display your latest post. Petty blogger template comes very handy, when you’ve publish something hot and want to display it to your loyal readers. It comes with very smooth layout. You can easily display your bio info top right sidebar section and introduce yourself to your readers. You can also link your popular social network profiles in sidebar section. So they can easily find you. The last but not least feature of petty blogger template is that you will get related posts right below the latest post of your homepage. It means whenever you publish new post and assign it new tags, then the other posts in same category will also start appearing right below it. It help your site readers to browse those articles and bring your more pageviews as well as improve your user experience.